Are you a video game player and do you find it hard to switch off your PlayStation or Xbox at night? You are not alone. Most people who play video games are struggling to press the off button on their gaming consoles, especially at night. Research shows that video game addiction can cause insomnia and other serious problems. It is therefore important for gamers to avoid spending most of their night hours gaming. Even though gaming can cause insomnia, that does not mean you should stop gaming. All you need is to have a plan. Numerous studies have shown that if gaming can be played appropriately, it has many benefits. So how do video games cause insomnia? Insomnia is a sleep disorder. People with this condition find it hard to stay asleep, fall asleep or both. They do not feel refreshed when they wake up in the morning like other people. • Waking up regularly at night and having a lot of trouble to sleep again. There is primary insomnia and secondary insomnia. Primary insomnia means that the sleeping problems are not linked with other health issues, and secondary insomnia is one that occurs due to health problems such as depression, asthma or cancer. Interference with normal sleep schedule can lead to insomnia. Switching from day-shift to night-shift, playing digital games or watching movies till late at night can cause insomnia. Any hobby or behavior can become dangerous if it starts interfering with someone’s mental, physical or emotional health. For instance, gaming can become a harmful activity if time used becomes extreme. If a child or an adult is consumed by gaming habits that he or she starts neglecting important duties, it can lead to health problems. People who struggle with game addiction can play their favorite games for extended hours, neglecting needs such as sleeping or eating. They often utilize night-time hours meant for sleeping to play games. Prolonged periods of sleep deficiency can lead to major problems that include insomnia. This can harm someone’s health since sufficient sleep is vital for several functions of the body. Sleep disorders such as insomnia can lead to a comprised immune system. This can cause mental illness such as anxiety, depression and many others. Apart from insomnia, video game addiction can lead to a drop in school grades, loss of jobs, and omitting important responsibilities. Hence, if you or a person you know is struggling with insomnia due to game addiction, it is wise to seek professional help. Video game addiction is just like other forms of addiction. Hence, if the addiction is not well addressed, it can lead to serious complications for the players and people related to them. Today, video gaming is so popular that you may see children playing their favorite games all day. Based on recent studies, more than 60 percent of kids around the world play digital games every day. In today’s modern world, people can play online games on many devices. It is possible to access online games through computers, gaming consoles, smartphones, and tablets. Gaming has transformed many sectors such as schools, hospitals, and military departments; but it can have serious effects if misused. It is easy for someone to become a gaming addict, particularly if they play late at night. Since games are easily accessible, it is simple for kids, teenagers, and adults to play digital games at night. Considering that gaming is addictive, it can have mental and physical effects. Since work or school take up a huge portion of someone’s time, most people sacrifice their sleep to play video games. This can lead to insomnia and other health problems associated with lack of sleep. 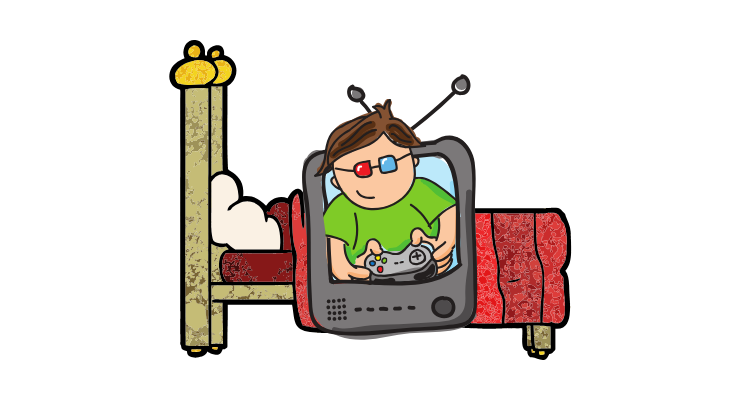 When someone engages in gaming for most of his or her time, personal hygiene is overlooked. When someone is addicted to gaming, he or she can easily ignore taking care of their personal health. Some personal health issues include taking a shower, brushing their teeth or changing clothes. It can also lead to diseases such as dental issues, acne, and many others. Through digital game addiction, depression can easily take over an individual’s life. This is because most gamers find themselves enslaved by the game addiction. Video games can cause stress when someone becomes overly obsessed with a game and cannot control their emotions. And they normally feel that the only way to cope with stress is to continue playing until they win. If you or your child is struggling with insomnia, you know the frustration. There are several ways on how to prevent gaming insomnia. Insomnia can affect your mental and physical health; bringing consequences to your social life. Unluckily, there’s no strategy that you can use to prevent gaming insomnia. Just like other addictions, the best way to prevent insomnia is a substitution. Start by substituting your uncertain behavior with a more positive one. Physical activities and socially engaging activities are some best alternatives for gaming addicts. Another way to prevent insomnia and other issues associated with gaming addiction is by joining a support group. If you feel you cannot stop playing your favorite video game until the late hours of the night, joining a support group can help. These support addiction groups can offer help by providing ways on how others overcame the problem. Family or individual therapy is another effective option of preventing gaming addiction that can lead to insomnia. Kids and teenagers who experience issues at school prefer to play digital games even at night to escape real life problems. But if parents can identify issues like low self-esteem, bullying or some problems at home, they can take immediate action. Video game insomnia and other game addictions are harmful to people’s lives. But since there are many positive effects of playing video games, moderation is recommended. As a parent, it is important to become involved in your child’s gaming habits. Always look for the signs mentioned above to determine if your child is becoming addicted to gaming. Don’t let video game insomnia control the people you love, offer alternative activities other than playing games.